This is the fourth part in this series, which talks about, creating multi frame applications in the Internet Transaction Server (ITS). The multi frame application in the HTML corresponds to sub-screen module pool programming in ABAP. This article is probably the most important one in the series, as most of the standard SRM transactions contain sub screens. The content presented in this article will help you to understand the development of web transactions for the corresponding sub screen module pool programs. To explain the development of multi frame applications, an example program with name ZYMOVIE3 has been created , which contains one main screen (9000) and two sub screens ( 9001 and 9002). The main screen 9000 contains two input fields “Year” , “Category” , two pushbuttons “Winner” , “Nominees” and one sub screen area “SUBSCR”. The sub screen 9001 contains one I/O field with name “winner”. The sub screen 9002 contains three I/O fields with names “nominee1″, nominee2” and “nominee3”. The program logic is very simple. 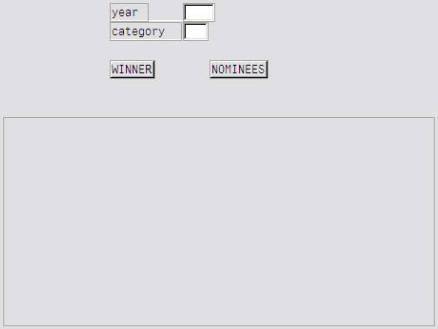 When the button “winner” is clicked, sub screen 9001 is called and when “nominees” button is clicked sub screen 9002 is called. The ABAP logic is not explained here, assuming that the reader has the necessary knowledge about module pool programming. This HTMLB function creates a frame on the webpage with the name SUBSCR. This name is same as the name of sub screen area in screen 9000. Another important thing to understand is about the creation of the tab buttons . In most of the SRM transactions (like process purchase orders, settings or sourcing cockpit etc., ) , the navigation between different screens happens through tab buttons , instead of push buttons For example in “Process purchase orders” transaction we have “header data” and “Item data” tabs. When “header data” tab is clicked, system displays header data and when “Item data” tab is clicked, item data is displayed. In reality these tabs are developed as buttons in the module pool, but in the web page these are displayed as the tabs. This is possible by one of the HTMLB function called “BBPTab()” . Function BBPTab() has three important input parameters. In the above code the line `BBPTab(“”,winn.label, “WINN”)` makes the tab “winner” inactive and triggers the function code “WINN” in SAP GUI when the user clicks on this tab. 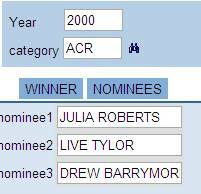 Similar logic holds for the “NOMINEES” tab also. The important thing to note here is the “~target ” parameter. The ~target parameter tells the system, where to post the values when the form is submitted by the user. The ~target parameter in this example is “SUBSCR’, sub screen area of the main screen 9000. This makes the system to put the sub screen 9001 in the sub screen area of the main screen. The code for the second sub screen 9002 is exactly same. The below screenshots show how the screen looks in the web, when the user clicks on “WINNER” tab. I have a question on integrating portal with SRM. I have integrated SRM 5.0 into Portal.Most of the iviews are IAC i.e., all are ITS based services. The issue is that the Portal Theme does not get reflected on these services after integration. When a BSP or Webdynpro is integrated the the application gets the Portal Theme when executed from Portal but the ITS services are not getting this. Now I know that there is an OSS raised in SAP and that their recommendation is that we modify the stylesheets within SRM itself.(ebpapplication.css). Is there any guide which explains on a step by step basis on how to do this? I have tried modifying the stylesheets through this method, but am not sure if I am doing it right, since its not working! Any help on this is greatly appreciated. A wonderful article from Sankar , you rock ! Rahul , You can come in the SAP Portal and look in to the SAP ITS theme generator ( System Administration ->Portal Display ->ITS Theme Generator ) and then make it avaliable to the ITS , this will give the SRM 5.0 ITS services Portal look and style. where customer got confirmed by sap that the only whay to adapt look and feel is changing the css in SRM itself. Have you been aware of this or this there something else we missed? like Do you want to approve?